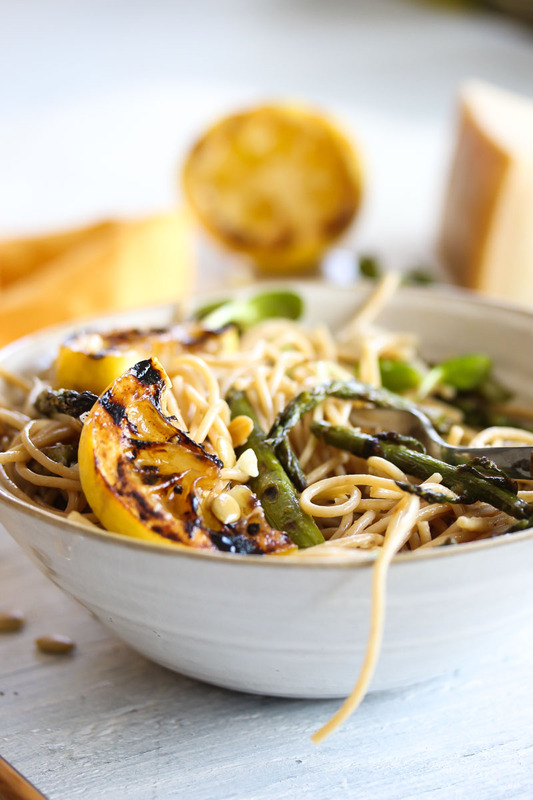 Zingy lemon-garlic pasta tossed with charred asparagus, parmesan, and cheese. A spring-forward, simple pasta dish bursting with bright flavor that’s ready in under 30 minutes. Spring has almost sprung and I’m already channeling it with a bounty of farmers market produce. Asparagus, peas, artichokes, beets, leeks! I went a little crazy over the weekend, but the explosion of spring produce just gets me feeling some type of way. Was anyone else feeling the effects of the lost hour of sleep yesterday? I honestly forgot about it until I woke up Sunday morning at 8:30am (a solid hour later than I normally sleep in), yet still felt exhausted (way too much wine Saturday night). I was on the struggle bus most of the day, but happy to report that I feel almost-conscious today. I love that this pasta feels super light, yet is full of flavor. 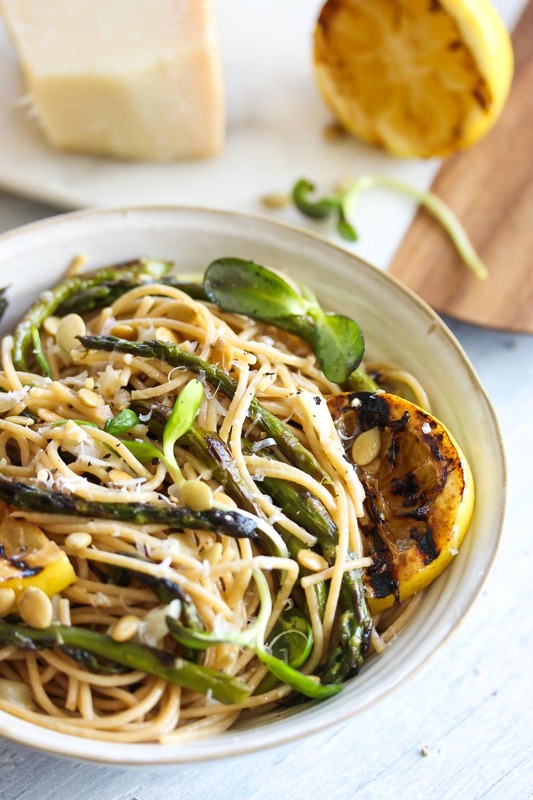 Garlic and shallots are simmered in olive oil, white wine, and lemon juice before being tossed with whole-wheat pasta, greens, asparagus, and parmesan. 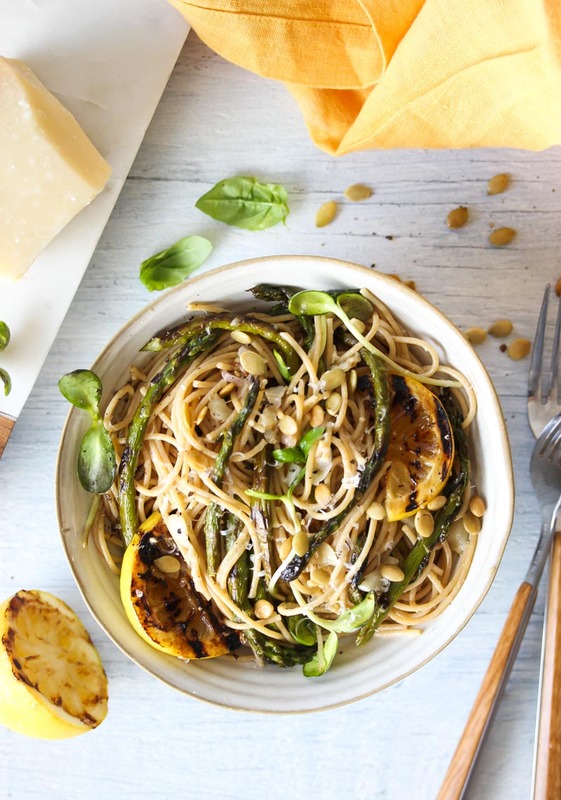 Charring the asparagus deepens the flavor and adds rich depth to the pasta. Parmesan lends a nutty, salty tang which compliments the zesty white wine sauce beautifully. Roasted pine nuts or pepitas add welcomed crunch and toasty goodness. If you’re craving an extra hit of protein, seared shrimp or shallots would be a wonderful addition. You could even toss some shredded rotisserie chicken in the mix for ease and convenience. This recipe can easily be made gluten free by using brown rice pasta. You could also make it vegan by subbing the parmesan cheese for nutritional yeast. Serve it with a simple side salad and homemade garlic bread for the ultimate weeknight meal. Lose an hour of sleep, gain a bowl of pasta. I’m totally OK with that algorithm. Cheers! Cook spaghetti according to package instructions. Drain pasta, reserving ½ cup pasta water. Set aside. White pasta is cooking, heat 1 Tbsp. oil in a large skillet over medium-high. Add asparagus; cook 5 minutes without turning, until skin starts to blister. Toss around and cook 3 to 4 additional minutes until skin is well-charred. Transfer to a plate and reduce heat to medium. Add remaining 3 Tbsp. oil to pan. Add shallots; cook 2 minutes, until softened. Add garlic, salt and pepper; cook 30 to 60 seconds, until aromatic. Add white wine, lemon juice and zest; simmer for 5 minutes. Cut asparagus into thirds. Add chopped asparagus, spaghetti, parmesan, and basil to pan. Toss to combine. Add additional pasta water in small increments if too dry. Divide evenly into each of 4 bowls. Sprinkle seeds evenly over top and add additional parmesan, if desired.